Looking to improve your Yiddish this summer? There are options all over the world, from traditional classroom-based programs to music festivals, and everything in between — and we’ve done the research so you don’t have to. If you’d like to suggest an addition or correction to this list, please contact us. Housing: Not included; dorm accommodations possible. Cultural Component: Intensive exploration of Yiddish literature (in Yiddish and in translation); study of Yiddish culture, theater and film; Yiddish theater workshops; participation in Yiddish community events and activities in Melbourne’s vibrant, unique Yiddish community. 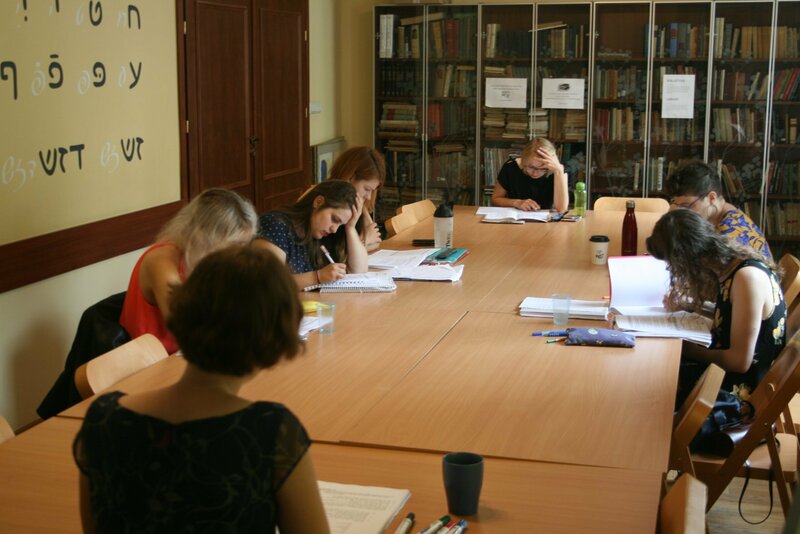 Students at the International Summer Seminar in Yiddish Language and Culture (Warsaw, Poland), 2018. Cultural Component: Lectures, film evenings, workshops, guided tours of Jewish sites in Warsaw and visits to the Jewish Historical Institute and other venues and museums, Shabbat dinners. 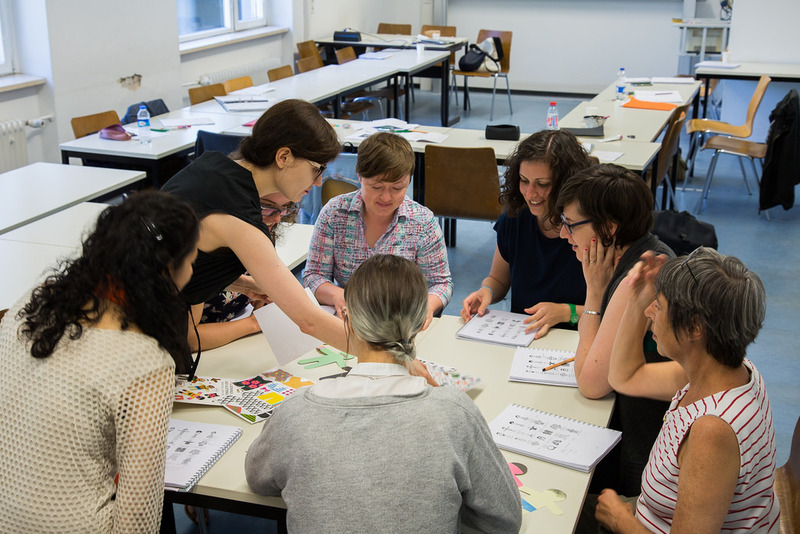 Read More About It: Katarzyna Markusz, “Yiddish comes alive in Warsaw every summer,” JTA (July 14, 2017); Kendra Berry, “Using Yiddish to fight the ‘othering’ of Jews in Poland,” University of Washington Stroum Center for Jewish Studies, 2018. Dates: July 11-August 18 (four one-week courses). Housing: Not included. Registrants receive 10% off at a local hostel. Levels: Four levels, beginning to advanced. Cultural Component: Part of a larger cultural program including music and dance workshops, with frequent evening jam sessions. Read More About It: Itzik Gottesman, “Ten Years of Yiddish Summer Weimar,” Forward, August 18, 2010; Henry Bernhard, “”Yiddish Summer” in Weimar: Klezmer und jiddische Kultur,” Deutschlandfunk, 2016; Yael Breuer, “Leading Yiddish festival reveals ‘unseen diasporas.’”Jewish News Online, July 13, 2017. Housing: Not included. A list of hotels/apartments will be sent on request. 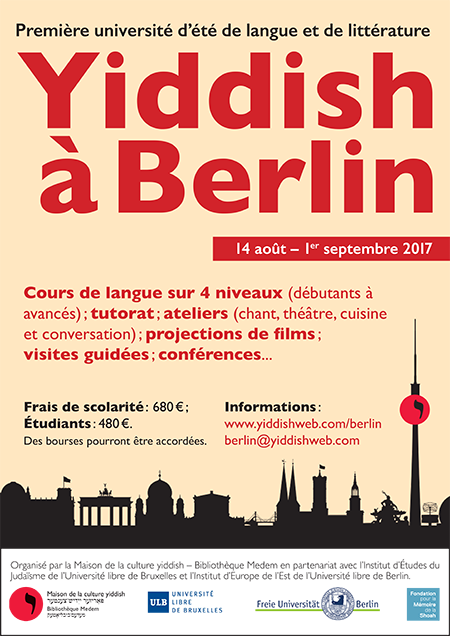 Levels: Five levels, beginner to high advanced, as well as a pedagogical seminar for Yiddish teachers. Cultural Component: Singing, theater, conversation, and cooking workshops; guided tours; lectures; film screenings. Read More About It: Read Ekaterina Kuznetsova’s reflections in In geveb here. Housing: Not included. Discounted housing offered at the University of London. Levels: Five levels, beginning to advanced. Cultural Component: Part of a larger program with courses on Yiddish song, culture, and dance that run simultaneously. Housing: 800 USD for double occupancy (optional). Levels: Five levels, beginning to advanced, and an advanced research seminar. Read More About It: Justin Cammy, “Inhabiting Multiple Homelands: Teaching Yiddish in a Summer Yiddish Program,” In geveb, November 13, 2017. 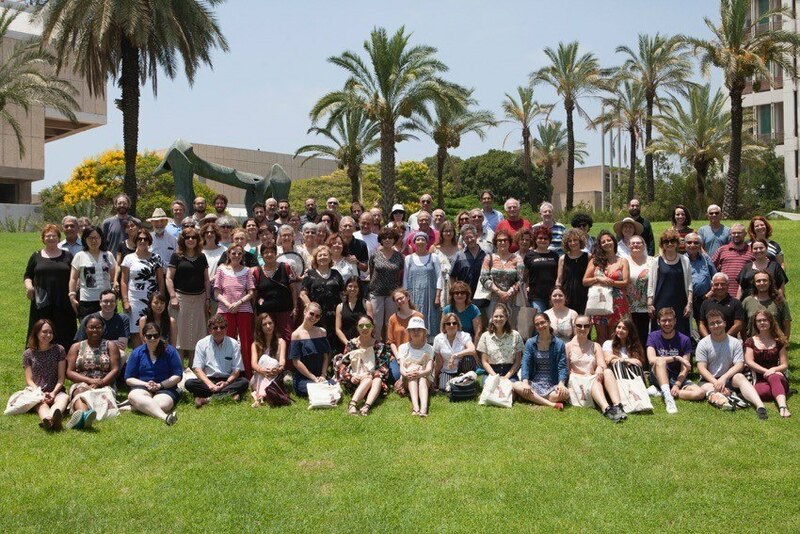 Group photo, Naomi Prawer Kadar International Yiddish Summer Program at Tel Aviv University (Tel Aviv, Israel), 2018. Cost: Tuition-free. All students are responsible for their housing and food costs. Intermediate students are eligible to participate in an internship in exchange for subsidized housing as well as a 1,000 USD stipend for living expenses. Levels: Two levels, introductory and intermediate. Cultural Component: Beginner students take a for-credit culture course while intermediate students have the option to participate in a paid internship, as well as occasional culture and literature seminars with scholars. For all students, the program also includes a four-day field trip to New York City and tickets to Yidstock: The Festival of New Yiddish Music, as well as a plethora of Yiddish cultural activities, excursions to local attractions, and extracurricular activities like film screenings and student-led workshops. Other: Students can receive up to 6 college credits. Open to college students and recent graduates ages 18-26. Noam Green and Tova Benjamin, “Seeking and Queering Utopia: A Chat About the Steiner Summer Yiddish Program.” In geveb, November 2017. Housing: Not included; housing available at extra cost at the 92nd Street Y in Manhattan. Cultural Component: Conversation, literature, and culture classes in the afternoons, lectures on Yiddish civilization (in both English and Yiddish) by leading scholars, translation, theater, and singing workshops, tours of the Lower East Side and Borough Park. Read More About It: Leana Katz, “By Learning Yiddish, I Can Access a Part of My Heritage,” The Globe and Mail, November 9, 2016. Cost: 2950 USD (3907.91 CAD, 2587.06 EUR); cost includes meals; limited scholarships available. Levels: Beginning and upwards (intensive program). Advanced students may visit for the two shabosim. Cultural Component: Students also work on the farm. All food is kosher and shabes is observed; davening is Orthodox. Read More About It: Sam Frizell, “Inside A Unique Yiddish Farm Thriving 50 Miles From Manhattan,” The Gothamist, August 8, 2013. Description: Yiddish Vokh is a language immersion retreat. Volunteers lead art activities, lectures, discussions, workshops, and sports. 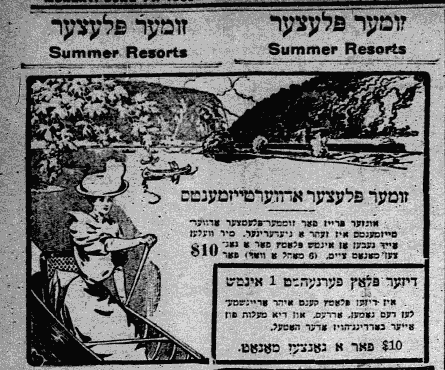 Participants swim, attend campfires, concerts, talent shows, and dancing, all in Yiddish. Read More About It: Sandra Fox, “Recreation as Education: Yiddish Vokh 2017.” In geveb, October 31, 2017. Description: Four levels of Yiddish classes, dance & klezmer instruction, theater & music workshops, concerts & entertainment, children’s program, retreat activities. Read More About It: Andrew Brownstein, “Yiddishland Brings Diverse Group Together for Language and Culture.” Forward, June 27, 2014. 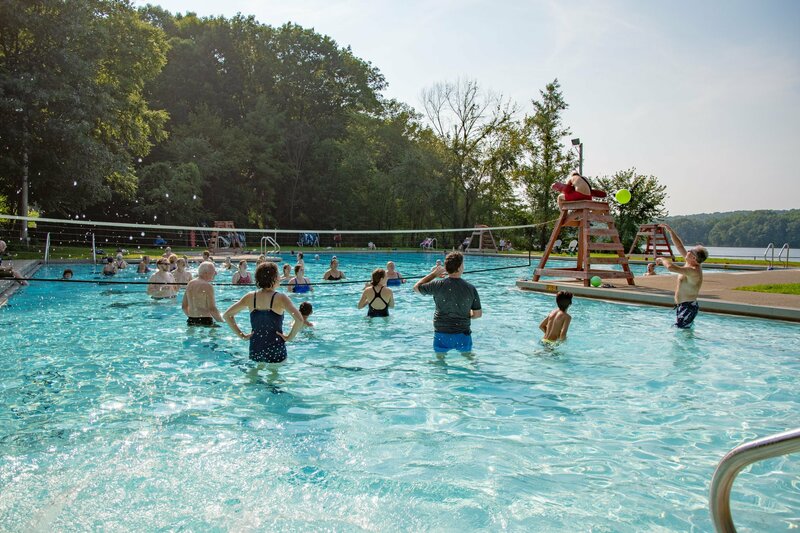 Participants play in the pool at Trip to Yiddishland 2018, courtesy of The Workmen’s Circle. Description: Classes in music theory, repertoire, roots and traditions of Yiddish Song, modes and melodies, master-classes and a Yiddish Choir. Learn More About It: Listen to a podcast about the event here. Description: Classes in traditional klezmer; history, melodies, ornamentation, dance and accompaniment. Description: Almost 300 events including workshops, lectures, discussions, guided tours, concerts, and jam sessions. Read More About It: Annette Insdorf, “The Jewish Culture Festival in Krakow: A Celebration,” Huffington Post, December 6, 2017. 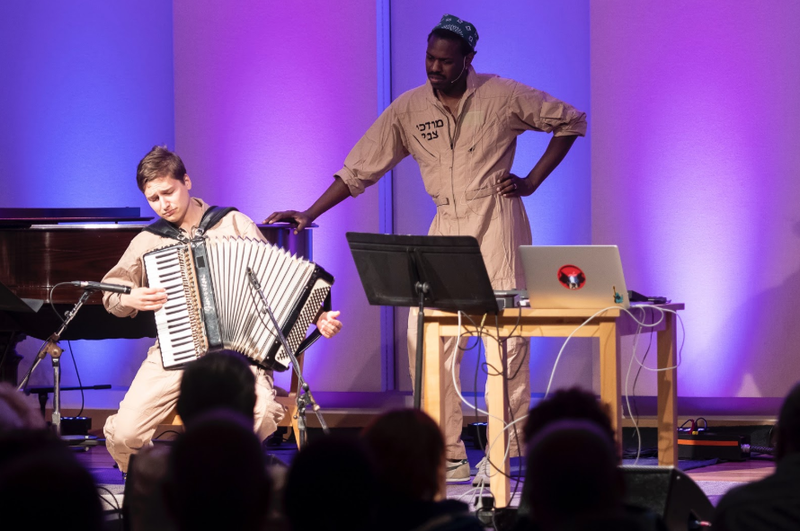 Description: A festival of musicians who weave elements from traditional Jewish music, jazz, Americana, and other styles to take klezmer in new directions. Application Deadline: The deadline for general registration is July 1st. The deadline for scholarship applications is May 1st. Cost: Depending on type of accommodation, costs range from 900 USD/CAD for off-site registrants, 1050 USD/CAD for tents, 1,100 USD/CAD for space in a shared cabin, or 1,650 USD/CAD for a hotel style room in the Retreat Centre. Special rates also available for families with children. Scholarships are available for emerging artists and scholars ages 16-35; reduced tuition for scholarship recipients is set at 375 USD/CAD. Tuition includes housing (except for off-site registrants), meals, and the full artistic program. Levels: Introductory, intermediate, advanced, as well as other classes, lectures, and other activities conducted in Yiddish. Cultural Component: KlezKanada’s Laurentian Retreat is a week-long immersion in Yiddish culture, arts, and music attended by an international and intergenerational community every year. In addition to Yiddish language programming, KlezKanada is centered around intensive instrumental and vocal workshops in klezmer and Yiddish music, as well as classes in Yiddish dance, theater, and visual arts, and lectures and film screenings in topics related to Jewish history, literature, and culture. In the evenings, there are concerts featuring some of the world’s best klezmer bands, dance parties, and a late night cabaret. All this and more in an idyllic setting by a lake in the Laurentian Mountains. Application Deadline: February 15. Qualified applicants are graduate students and faculty planning to teach Holocaust-related courses at institutions of higher education. Description: topics include: the religious history of European Jewry; the history of the Holocaust; the Holocaust in art, film and literature; gender during and after the Holocaust; Jewish responses to persecution; recent methodological and historiographical approaches to the Holocaust; and Holocaust pedagogy. Cooper, Miranda. “Yiddish in ale lender! 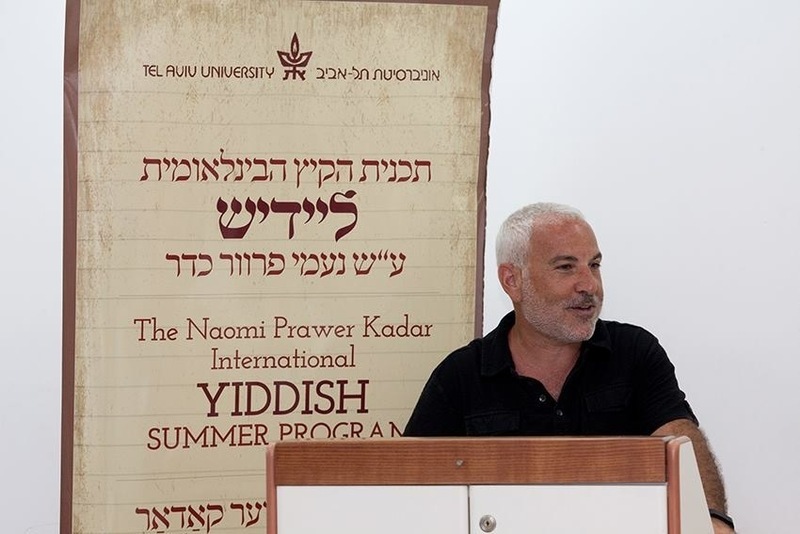 Yiddish Summer Programs Roundup 2019.” In geveb, January 2019: https://ingeveb.org/pedagogy/yiddish-summer-2019. Cooper, Miranda. “Yiddish in ale lender! 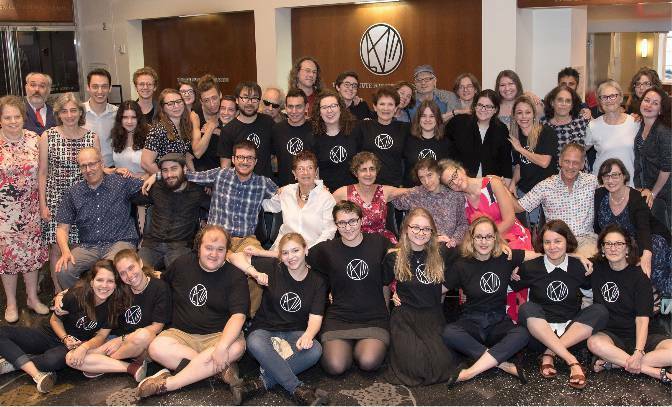 Yiddish Summer Programs Roundup 2019.” In geveb (January 2019): Accessed Apr 20, 2019. 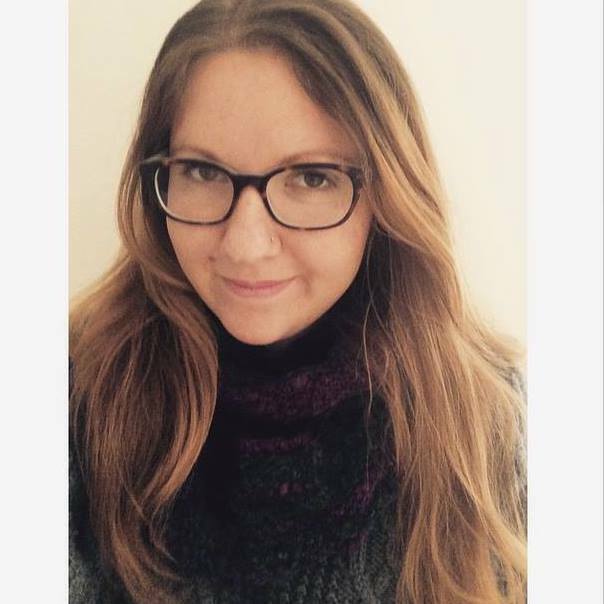 Miranda is the Communications Editor and Operations Manager for In geveb.